Shiveluch (Kamchatka): Explosive activity continues. Volcanic Ash Advisory Center (VAAC) Tokyo warned about a volcanic ash plume that rose up to estimated 13000 ft (4000 m) altitude or flight level 130 and is moving at 20 kts in S direction. Explosive activity continues. Volcanic Ash Advisory Center (VAAC) Tokyo warned about a volcanic ash plume that rose up to estimated 13000 ft (4000 m) altitude or flight level 130 and is moving at 15 kts in S direction. Explosive activity continues. Volcanic Ash Advisory Center (VAAC) Tokyo warned about a volcanic ash plume that rose up to estimated 13000 ft (4000 m) altitude or flight level 130 and is moving at 10 kts in E direction. 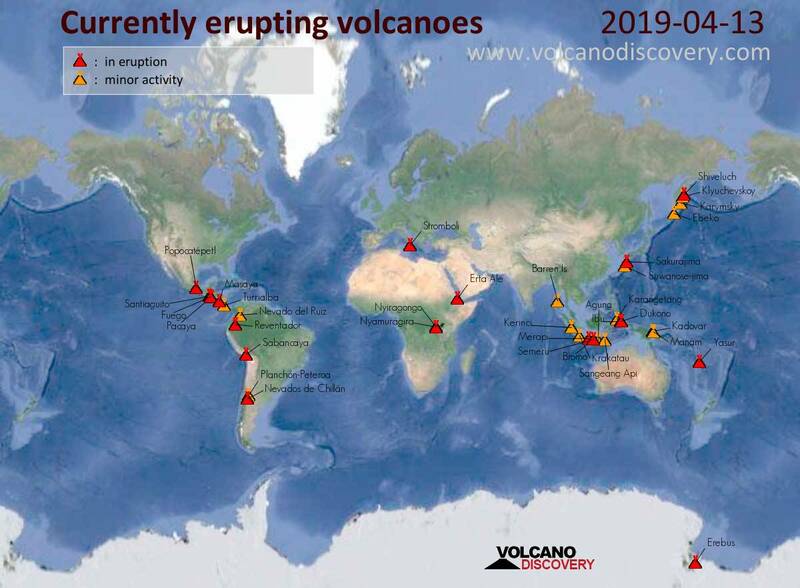 Merapi (Central Java, Indonesia): (12 Apr) Volcanic Ash Advisory Center Darwin (VAAC) issued the following report: LAVA FLOWS OBS ON WEBCAM AT 12/2013Z. Kerinci (Sumatra): Volcanic Ash Advisory Center Darwin (VAAC) issued the following report: VONA STATE ERUPTION TO FL140 AT 13/0936Z. Reventador (Ecuador): Explosive activity continues. Volcanic Ash Advisory Center (VAAC) Washington warned about a volcanic ash plume that rose up to estimated 17000 ft (5200 m) altitude or flight level 170 .